Urban Stitcher®: In the chips! 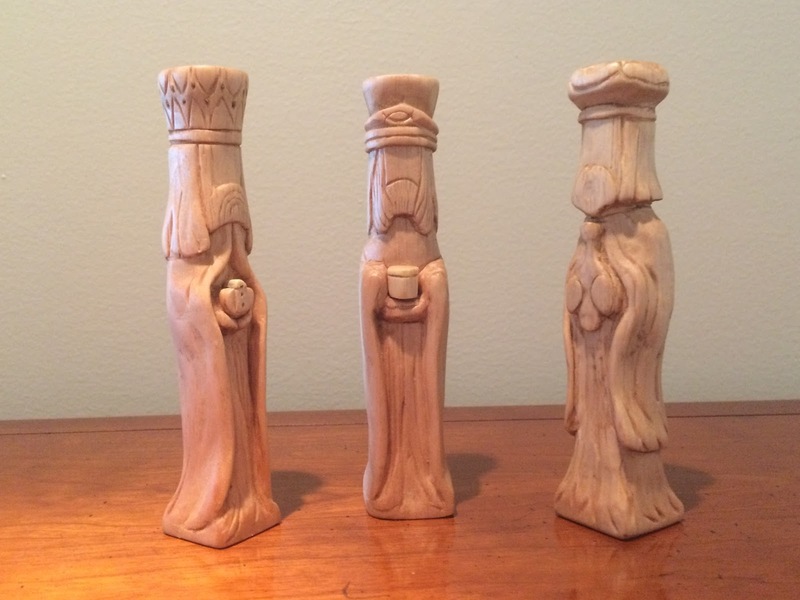 Since my last post, I have completed 11 carvings. 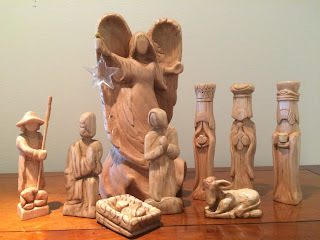 Nine of the completed carvings are part of a nativity set. Mary was the first piece; the angel completed the set. 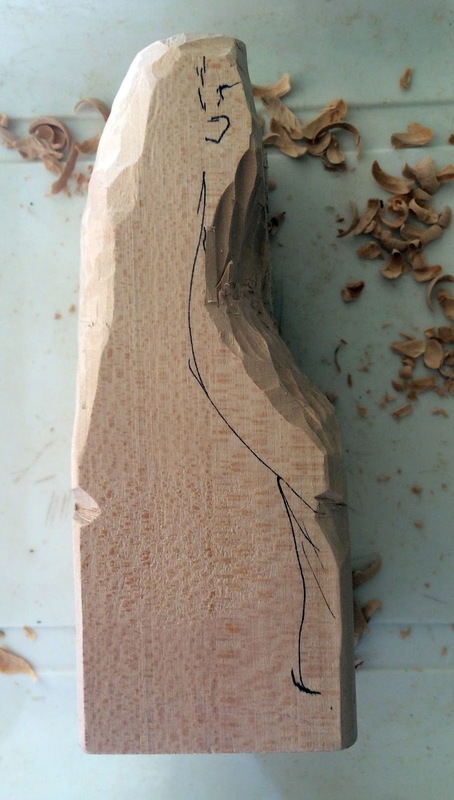 My skills improve a little with each carving, so I fight the inclination to go back to develop each piece a little further. I am trying to stick to the rule, that once my name, date and the carving number are added, it is done! Although these pieces were carved to be a set, experimenting with finishes and wood sizes make them each a little different. Pieces numbered 6-9 are Mary, Joseph, baby Jesus and a donkey, none of which were photographed during the carving process. The basswood for these first four pieces were from a bag of assorted size wood blocks. 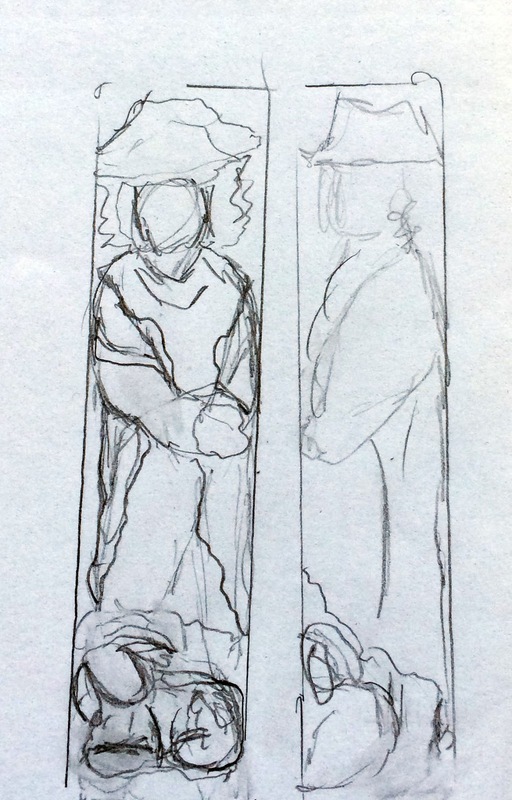 Mary and Joseph are 4" tall x 2" wide by 3/4" thick. The donkey and baby Jesus were made from blocks 2"x 1-1/2"x 3/4". I first painted Mary and Joseph, but did not like the result, so sanded them and finished with processed linseed oil tinted with a bit of oil paint. 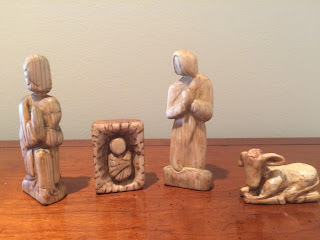 The wood used for the shepherd boy measured 4" tall x 1-1/2" wide x 3/4" thick. 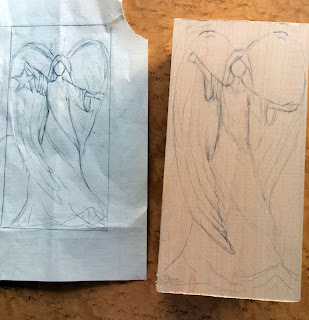 It helps to plan the carving by tracing the wood block onto paper and sketching the image. 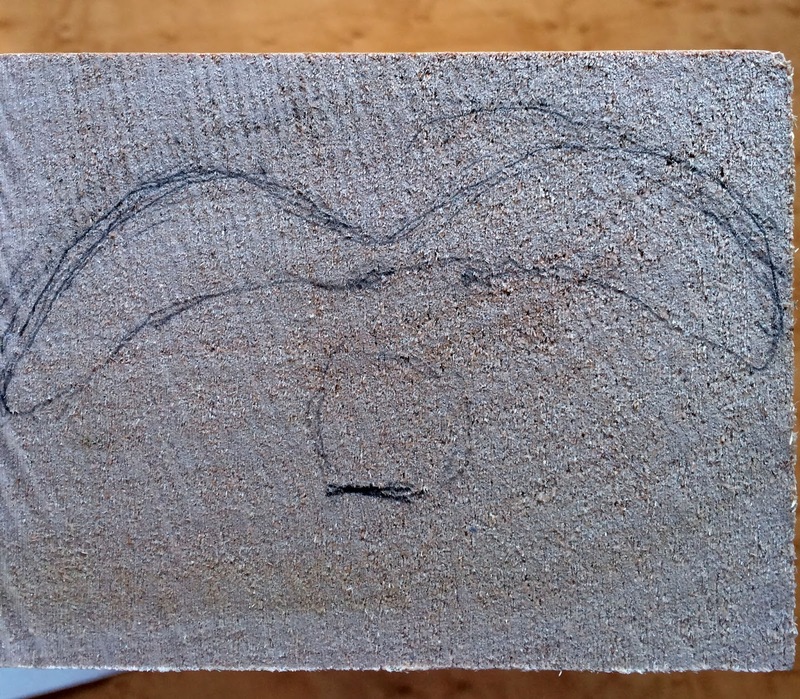 Once satisfied with the image on paper, a fine point permanent marker was used to draw the image onto the wood. 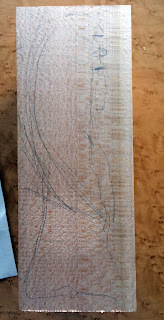 Pencil can be used, but I found that the markings sometimes rub away before I am ready to carve that area. A very small bit was turned by hand to drill a hole through his hands. His staff is a wood skewer. 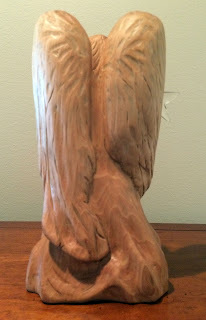 The finish is processed linseed oil tinted with a small amount of oil paint. 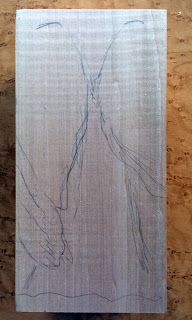 After using all the wood in the bag of assorted sizes, I purchased 10 pieces of 2" x 2" x 5" basswood blocks. 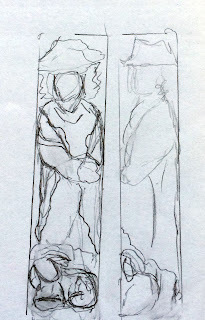 Because I wanted the kings close to the same size as Mary and Joseph, I cut one of the blocks into four 1"x 1" x 5" pieces. The kings were sealed with a mixture of varnish and paint thinner before applying the tinted linseed oil. Can anyone tell why I named one of these kings "Leon"? A large angel holding a star anchors the other pieces as a set. 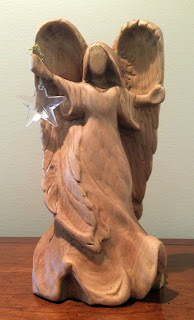 The wood was 8" tall, by 4" wide by 3" thick. 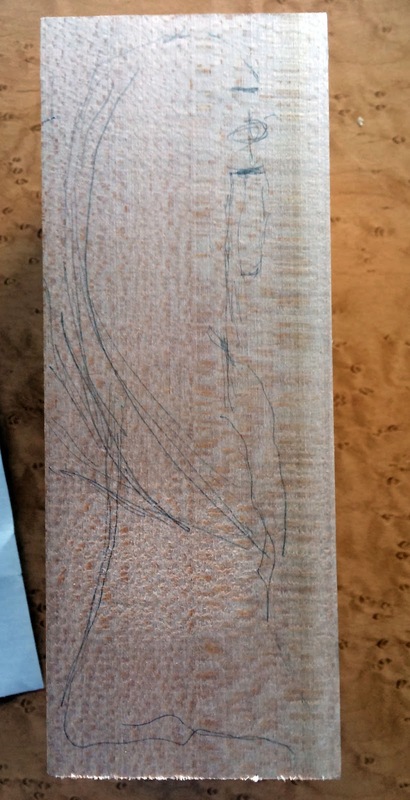 It did not seem very big when I was ordering the wood, but it turned out to be a large block of wood for small hand carving tools. 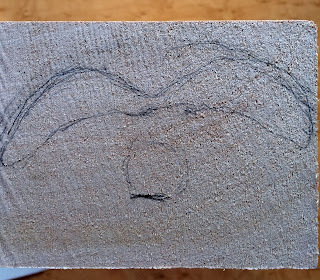 Pencil drawings on the block of wood helped identify where large areas could be removed with a small hand saw. 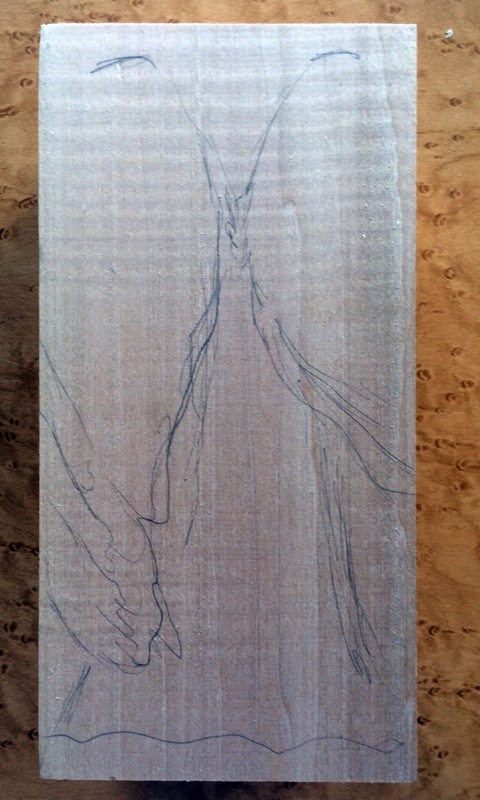 A section of the wood about 1" x 4" was cut from the top of the wood block. The bottom of her dress would flare to the full width and depth of the wood. As I carved, I continually re-marked the carving lines to ensure I did not cut away too much wood from the head and torso area. There was a slender line of dark, hard, brittle wood running through the wood from top to bottom on the left side. The line runs through her right fore arm. Care had to be taken when carving in that area. 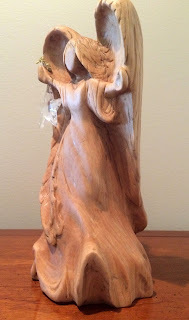 The tinted linseed oil turned the angel darker than desired, so I sanded for hours to remove the darkened wood finish. I re-defined some of the carving and finished a second time with untinted processed linseed oil. Three applications of the linseed oil were used. Even without the oil tint, the color is very close to the other pieces and the wood grain can be seen clearly. A small drill bit was used (by hand) to carefully drill a hole through her hand. The star hangs on a chain of crocheted machine embroidery thread. 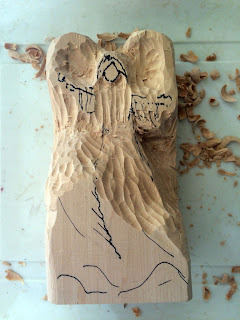 I am completing another small carving before cleaning up and rearranging my wood shop into a sewing room. My next posting should be a mixture of wood and thread. I hope you will come back to visit.